Dr. Brett Diaz, D.C. is the Founder of Scoliosis Treatment Alternatives with over 25 years of clinical experience. He is a Certified Nu-Schroth provider and a Certified Active Release Technique provider, a Certified Exercise Rehab Specialist and a SpineCor provider. He obtained in doctor of Chiropractic degree in 1987 at Los Angeles College of Chiropractic. Thr focus of his practice is the conservative treatment of scoliosis. He is currently the Director of Clinical Services at 6 offices in 3 states. 3 California offices - Irvine, Studio City and Campbell; 2 in Washington -Seattle and Vancouver and 1 in Colorado - Aurora office. 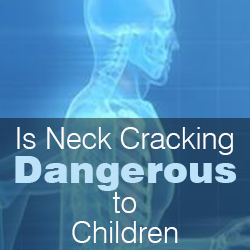 Is Neck Cracking Dangerous to Children? My 11 year old son, Kyle, began adjusting his neck by pushing sideways and upwards on his chin. Within the past few months he has increased the force required to get relief from the tension in his neck. When I asked him about it, he said the back of his neck hurts and when he “pops” it, it feels better. Now, as I said, it requires more force to adjust his neck, and he is doing it so often it seems habitual. I am wondering if this self adjusting poses any risk and/or danger. I copied Kyle’s father on this email. If you would be so kind to indulge us with information we need to get corrective treatment for Kyle, I would appreciate it. Thank you, and much gratitude in advance. What you are describing has the potential for hazard to his health. While an occasional “self adjustment” is no big deal, when someone does it habitually it can damage the joints in the spine making them hyper-mobile and unstable, especially in a young, undeveloped spine. While it likely feels good after he has adjusted himself the relief he feels is only temporary. That’s because the joints that he is likely moving are the ones that move too much already, while the ones that are really restricted remain stuck. That’s why he feels compelled to do it again 20 minutes later, but the pattern of repeated and habitual “cracking” only serves to exacerbate the problem. The hyper-mobility created by this habit can make an injury to the spine even worse. For instance should he be involved in a rear-end auto accident he would likely sustain greater injury due to the joint laxity. Also, there is the chance that by forcefully torqing his head to “crack” his neck he could actually tear the vertebral artery in the upper neck resulting in a stroke or even death. While this type of event is relatively rare, it does happen. There was a case of a man in his late 30’s here in Orange County several years ago who died after suffering a massive stroke caused by a tear in the vertebral artery for self adjusting his spine by grabbing his head and pushing on his chin to crack his neck. I would recommend that you insist that he stop this immediately for the reason’s stated above. If you’d like I can take a look at him to see if I can find anything that may be causing his feeling the need to self adjust and if so I can take care of that but in the interim he needs to begin weaning himself from this habit.